Yes, fall season is almost upon us. But I just can't help being drawn to all the colors and prints by the masters at incorporating lovely textiles into their designs. I always look forward to seeing the vintage-inspired cuts and beautiful textile prints by New Zealand designer Karen Walker and New York designer Lauren Moffatt for their new collections. Whether the pieces are from Fall or Spring/Summer collection and whatever hemisphere you're from, they seem appropriate for all seasons. Always classic and oh so pretty! These colorful outfits also serve as the perfect canvas for some of our everyday bags with their classic shapes, neutral color palette and timeworn look that just get better with age. 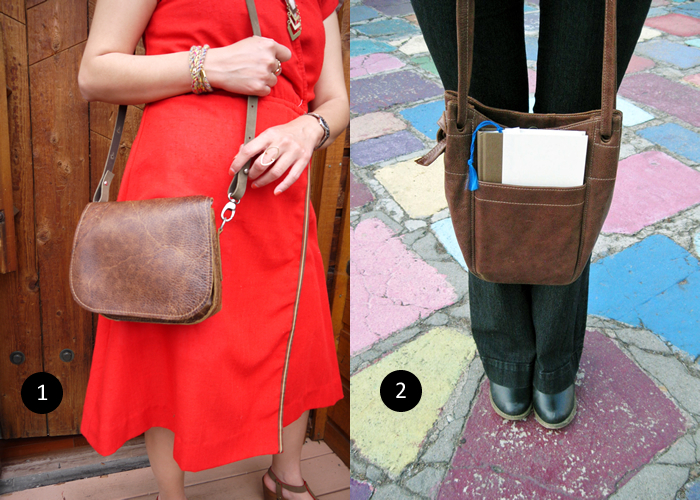 1) Ellen Truijen's Small Matroesjka Bag 2) Erin Templeton Small Tote Bag.